In March 2019, Parliament passed legislation to make the income tax process for most individuals more straightforward. These changes will apply from 1 April 2019 and to the end-of-year processes for the current tax year (1 April 2018-31 March 2019). Most tax refunds will be paid automatically from late May until July. 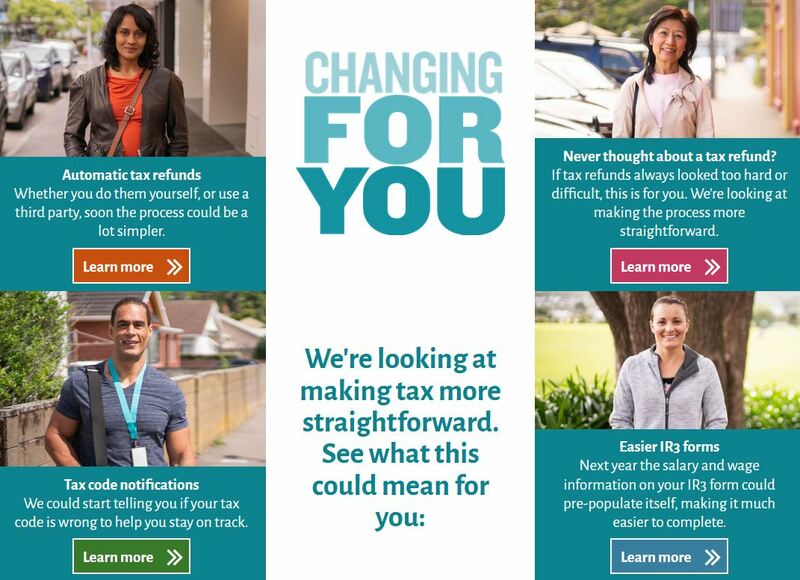 To find out more about the changes, and what these mean for you, visit the IRD webiste website. In March we held our final dress rehearsal to get our timing and sequencing right ahead of 26 April, when the next changes designed to make tax more straightforward come into effect. Our services will be unavailable for a short period, taking advantage of the Easter and ANZAC Day public holidays, to allow for the changes to be made. By closing over these dates, which include just two working days, we hope to minimise the disruption for you and limit the time our services will be unavailable. Our core systems, our front of office counters and our contact centres will shut down from 3pm on Thursday 18th April 2019. Our latest webinar aims to answer all of your key questions about payday filing. You can watch this on demand here. For more information on payday filing, visit the IRD website. Our new website will go live as part of our next transformation release in April 2019. Featuring a modern new-look homepage, the new site will also initially present child support, working for families and income tax content in a crisper, more accessible style, as tested on the beta test site. The remainder of the current IR website’s content will be updated, tested, and incorporated into the new site over the coming year. The greatly-improved site navigation, layout and global search will allow you to get around and search for content across the two sites during this time easily. An improved online experience for those who are visually impaired. If you have bookmarks or links to child support, working for families and income tax pages on the current IR website, there is a small chance these may break when the new site goes live, or redirect to other pages. You may need to re-establish these when the new site goes live.